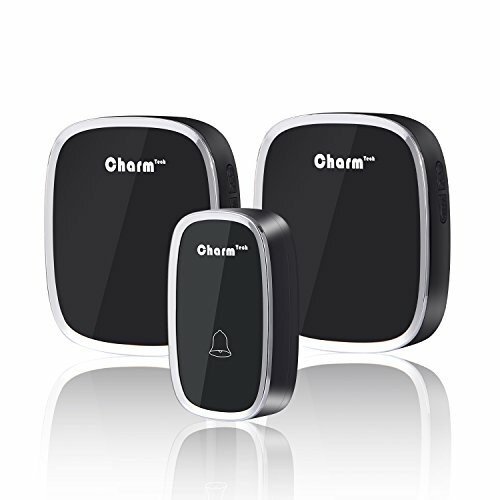 Wireless Doorbell - 80% Price Drop GO GO GO! Wireless Doorbell – 80% Price Drop GO GO GO! Easy Installation: No batteries needed for 2 doorbell receivers, just plug the receiver into an electrical outlet. Remote push button can be fixed to the door-frame with the attached adhesive tapes or using the screws and anchors which are included in the package, the 12V 23A battery for the transmitter is included. High Quality & Long Lifespan: Ultra-low-power design, energy saving and sustainable use. The transmitter battery can be used for over 1 year. Pure point control operation make the transmitter can withstand more than 100 thousand times click. You can enjoy your doorbell for years with only single purchase.